The term barbecue (also, BBQ or barbeque) can mean a lot of things. And the topic of barbecue – real barbecue – can be a contentious one. One word, so many definitions. Some call anything prepared on a grill barbecue. Others use the term reverently – dogmatically, even – in reference to a certain cooking methodology. Adding a blob of a sweet, tomato-based sauce qualifies as barbecue to some. The term can apply to an outdoor cooking apparatus. As in “throw some shrimp on the barbie.” Gas, charcoal, pellet or pit all can fall under the barbecue moniker. Others use the term synonymously with a picnic-like event one hosts on the weekend. When used in this way, the term congers up an en plein air spread with attendees resplendent in seersucker and gingham. Barbecue can be a competitive sport, complete with reality shows and bracketed competitions. Minor league contenders fall in the “patio division.” Whereas the major league divisions dole out serious cash prizes. Bitter debates rage across the U.S. over regions and styles of barbecue – pork vs. beef, sauce vs. dry rub, Texas vs. Kansas City, and mustard vs. vinegar. Barbecue joints range in variety from Carolina to Korean style, and don’t forget about the Hawaiian to Mongolian BBQ. Seriously good ‘Que is not just found in the outer reaches. From the East Village to Williamsburg to Hell’s Kitchen, New York City boasts rave-review worthy BBQ joints. Check out The Definitive Guide to the Best BBQ in NYC. Even the origin of the word is up for deliberation. Is it Caribe barabicu or the Spanish barbacoa? Yes, barbecue can be a contentious topic and after much research, sampling, and time spent on the patio, I have come to this conclusion. I am not a purist. I like it all. From cookouts to cooking contraptions, brisket, babybacks, and burnt ends, sauce and spice – I’m in favor of it all. 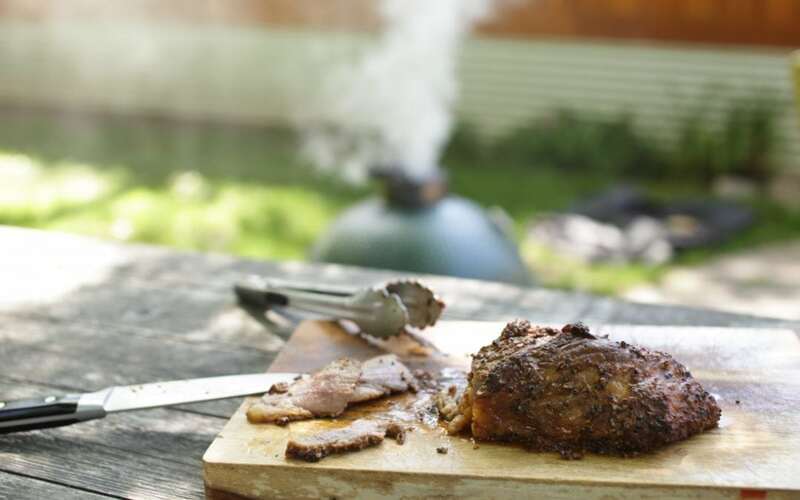 If there is one connective thread that holds all these uses together, it’s this – barbecue is not a thing to be rushed or hurried. Barbecue is the art of the slow – whether it’s the cooking or the savoring of other company. Hello Everybody! Katie Bradish here, telling you all about the classic Americana experience – the backyard BBQ. Remember one thing: It’s the art of slow – so take your time, and enjoy!